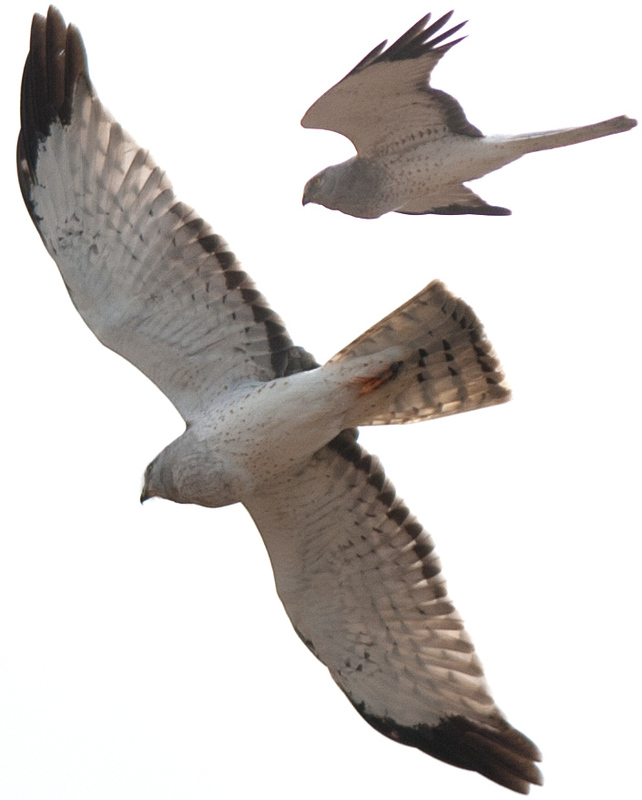 The Northern Harrier (Circus hudsonius) is a taxonomic issue. Recently divided from the European Hen Harrier (Circus cyaneus). 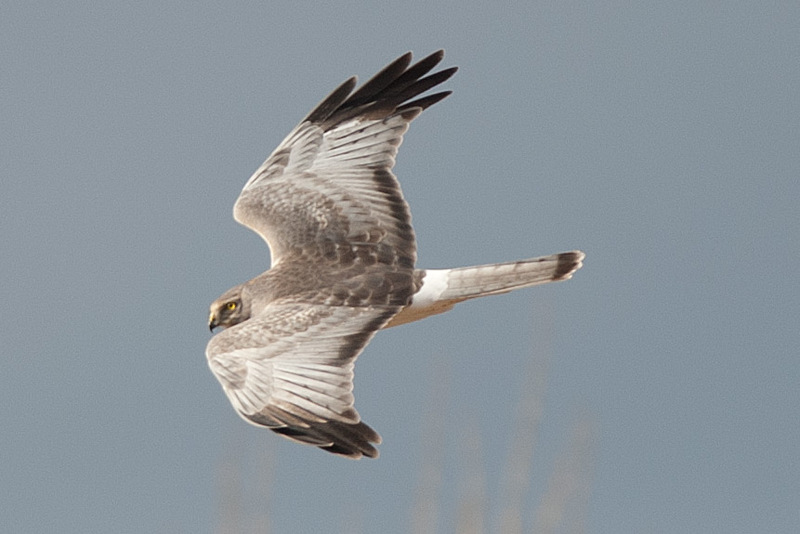 From All About Birds: “Northern Harriers are fairly common, but their populations are declining. The North American Breeding Bird Survey records a steady decline of over 1% per year from 1966 to 2014, resulting in a cumulative loss of 47%, with Canadian populations declining more than U.S. populations.” They nest on the ground in freshwater and brackish marshes. Males often have more than one nest active within their territory. At my outer Cape Cod hawk migration site, established in 1984 (Pilgrim Heights within the National Seashore), the male had three females on three nests. He defended the females from interlopers and delivered food two all his mates and offspring. One or two is common, with five nests and females, max. For North America, here are some images of this bird, where most birders would just like to see the adult male, known as the Gray Ghost. Heres an adult male, a composite, with a full crop, apparently having eaten within the last couple of hours! Observing this bulge is not uncommon for migrating hawks, but there are a few species for which this is uncommon: Harrier, Osprey/Bald Eagle, and others that eat soft food. That’s soft vertebrates (amphibians), inverts, fish. This bird has chowed down on something with hard volume, like a mammal… maybe an early chipmunk (7 April 2013). From my DigiBanding Project with Braddock Bay Raptor Research north of Rochester NY, here are a couple of immature Harriers. 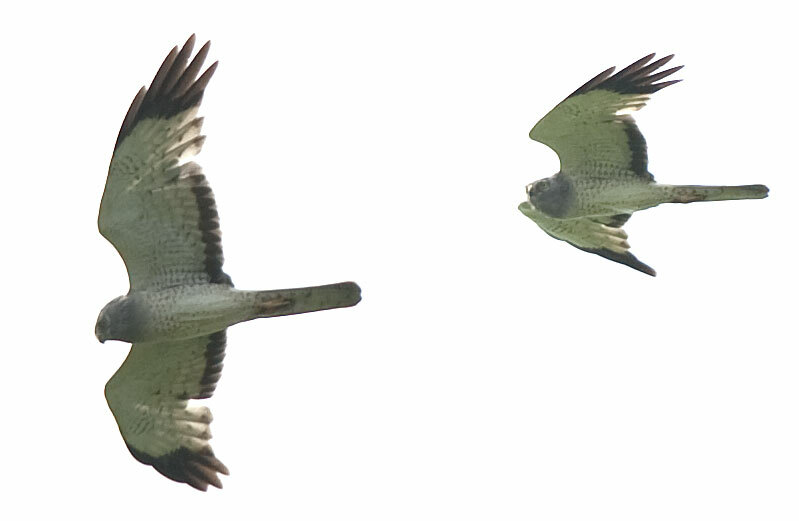 Both are shown in the project-required images: front and back with one wing extended. Late in the Spring migration, all manner of molt can be observed. Molt usual is timed to start on the home grounds. 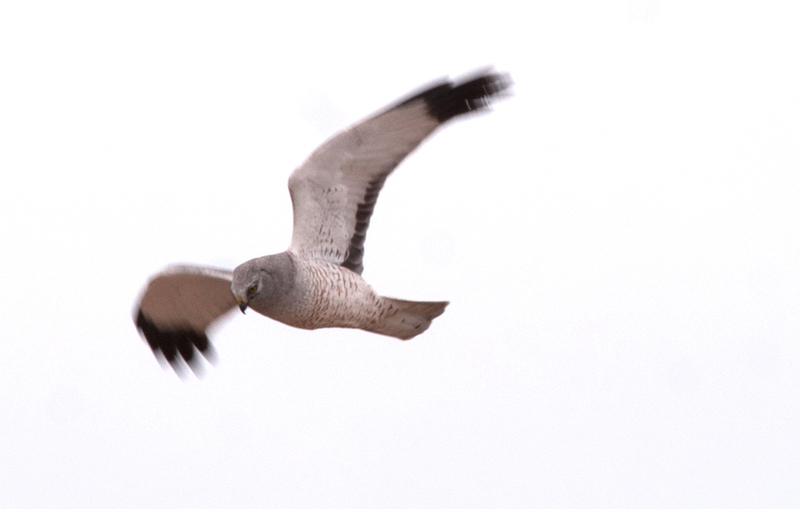 Here’s a late adult male Harrier, molting its first primary feathers enroute. (19 June 2010). This entry was written by whyevolutionistrue and posted on June 13, 2018 at 7:45 am and filed under birds, photography. Bookmark the permalink. Follow any comments here with the RSS feed for this post. Both comments and trackbacks are currently closed. I live about a mile away from the research blind, and had the opportunity to visit quite a few years ago. Kudos to all involved. Terrific pictures and commentary! The harrier is a very impressive bird. It seems to me to be a rather long-limbed hawk. On my walks I see red-winged blackbirds all the time because they love hanging out on power lines for some reason. With their chip-chip-chip sound they make. Little birds harassing big birds is a common sight too. Loved seeing that golden eye. How do you handle those birds without gloves? I don’t wear gloves to band hawks or owls. Some banders wear fingerless gloves to handle the lines that work the lure birds and the traps… to avoid string burns. Mostly you want to take care to control the bird’s talons, as most young hawks/owls don’t bite. Getting “footed” is very painful, and with most birds, it takes two hands to get the talons off your hand, wrist or arm. Falcons (evolutionary parrots) bite, as well as grab with their feet. So control of those parts is job one. Thanks for those. Love watching harriers…. Fantastic raptors! Great pics, and loved the commentary too. Thank you. Loved these photos and the scientific endeavors.